Lt. Ronald "Dexter" Evans was a Snake jock and operations officer in '70-'71. On the right at the Montana flag mini in 2001. 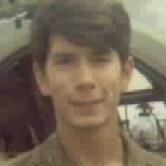 Ted 'Yoshi' Yoshimura was a LRRP in Co.H, 75th Rangers in Phouc Vinh '70-'71. Although not strickly a C Trooper he has more time in Charlie troop birds than 99% of anyone else in RVN. Ol' Yoshi must have had terrific faith in the eyesight of his team members when the bullets started to fly. On the right at his last reunion at Bragg Yoshi seems to be holding up. 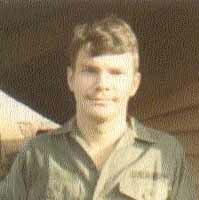 Sp5 William M.'Bill' Moeller on the left in Phouc Vinh in 1970. Bill kept our radios transmitting, also liked to shoot the 60 as a lift gunner. On the right in Scotland February 2001. Hey Bill, didn't Pop Watt tell you heavy drinking was detrimental to hair preservation?